There’s no real answer to What Makes Sammy Run?, the title of Budd Schulberg’s classic novel about a poor, Lower East Side kid who schemes and betrays his way to the top of the Hollywood food chain. But the book ponders it anyway, marveling at the mysterious engine that drives ruthless, empty ambition. 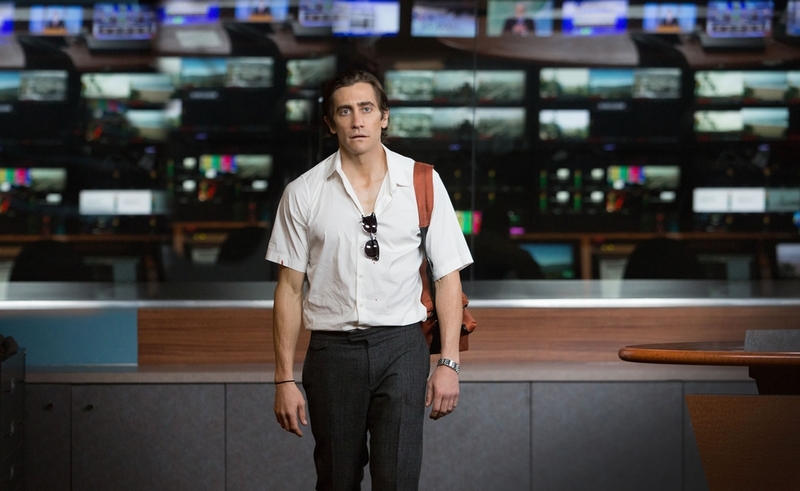 Dan Gilroy’s lurid thriller Nightcrawler has a lot of What Makes Sammy Run? in its DNA, along with TV news satires like Ace In The Hole and Network, which both suggested the most natural medium for go-getters like Schulberg’s Sammy Glick. As a critique of “if it bleeds, it leads” news-gathering venality, the film isn’t exactly blowing the lid off the Fourth Estate, especially when it apes Paddy Chayefsky’s weakness for turning characters into mouthpieces. But it’s absolutely riveting as a case study in sociopathic initiative, powered by a Jake Gyllenhaal performance that strips the varnish off the sweet, smiling, ingratiating persona that made him a star. Making a directorial debut after scripting several Hollywood movies—including Freejack, Two For The Money, and The Bourne Legacy, that last for his brother Tony—Dan Gilroy cross-pollinates genres with sometimes-reckless élan, offering a mishmash of black comedy, breakneck action, and social commentary under the banner of L.A. noir. But Nightcrawler has speed in its favor: With Gyllenhaal putting the pedal to the floor, the film rides shotgun through a nocturnal world of fires, car wrecks, and mangled bodies, all sobering scenes that are transformed into thrilling, camera-ready scoops. Gilroy is so plugged into his antihero’s grotesque opportunism that it’s hard not to feel a residual kick. Nightcrawler works best when Gyllenhaal is in hustler mode, trying to scam his way ahead either through the soft tactic of excess flattery, or more vigorous forms of arm-twisting. Shown first as a petty thief, stealing chain-link fences, copper wire, and scrap metal for cash, Louis Bloom (Gyllenhaal) happens upon a crash site where a freelance videographer (Bill Paxton) is recording footage for local broadcast news. Suitably inspired, Louis trades in a stolen bicycle for a video camera and a police scanner and gets to work, quickly establishing himself as a source for Nina (Rene Russo), a graveyard-shift news director for a struggling L.A. station. As his aggression continues to pay dividends, Louis picks up a faster car and a compliant assistant (Riz Ahmed) to navigate, and tries to beat the competition for graphic news footage. When he arrives at a grisly home-invasion scene before the police, Louis eagerly pounces on his biggest story to date, but crosses all sorts of ethical boundaries to do it. What’s striking about Louis isn’t that he violates ethics, but that he only vaguely recognizes that such boundaries exist. He’s a diabolical savant, given to monologues about hard work and motivation, but uncomprehending of human feeling insofar as it doesn’t benefit him. Unlike Kirk Douglas in Ace In The Hole, Louis can’t even pretend to care about other people, so he’s a Travis Bickle-like creature of the night, relating only to other creatures like Nina, who’s more or less a carbon copy of Faye Dunaway’s ratings-hungry executive in Network. As photographed by Robert Elswit, whose feel for Los Angeles has been well established in the films of Paul Thomas Anderson, Gyllenhaal is made to look gaunt and sub-human, with the whites of his eyes so pronounced that they’re almost alien. “What makes Louis run?” is a question that keeps Nightcrawler clicking along, even through passages where pace is all it has going for it. Nightcrawler gets into trouble as Louis grows more sophisticated in framing and staging the news, sacrificing the compelling mysteries of his ambition for larger, more didactic statements on the practices of local news. Watching Louis cross the line is far more interesting than listening to characters talk about how Louis has crossed the line, particularly when his big exclusive breaks, and the police enter the picture. There’s a scolding tone to Nightcrawler that runs counter to its pulp energy, as if Gilroy is telling the audience to be alarmed by the things that turn them on. But much as Gilroy tries to be his own killjoy, Gyllenhaal’s wickedness prevails.